I urge all people with a passion for justice to join together on April 13 in Washington, D.C., to say no to drone warfare! No one should sit passively and allow our government to wage a "quiet war" -- an undeclared war but a real war in our name! We have not had a voice in this undeclared war that has taken the lives of 5,000 people, mostly civilians and many children. Drone warfare is a cowardice approach to conflict. It is immoral and unjust and drone warfare is ironically sanitary where the bleeding and injuries are inflicted somewhere else and the American people are never fully aware of the lasting consequences and devastating damage to prospects of world peace. This is why we must march on April 13. I am marching because drones are a threat to my security as an American, my security as a Pakistani, the security of my brothers and sisters in the motherland, my security as a person of color inhabiting the earth, my security as a woman that will dissent, and they will destroy an earth that is already difficult for so many to tread on. It's time we Americans join the rest of the world in condemning President Obama's barbaric drone killing spree, a policy that benefits the war profiteers but makes us hated around the world. Enough!!! I will there on April 13 because, as an advocate against the re-colonization of Ivory Coast, I believe that drones will be used as war machines to re-colonize Africa. These war toys will surely target freedom fighters and activists opposing Western stooges in power in Africa. I will be out in the streets on April 13 protesting the use of these killer drones because the U.S. drone program is immoral and illegal. The killer drones are nothing more than U.S. death squads in the skies terrorizing people in Afghanistan, Pakistan, Iraq, Yemen, and now with greater use in Africa as America's imperial aggression continues unchecked. We, the people, need to be the check on this lawlessness and wonton militarism. On April 13 we need to come together and express another way of living in this world based on nonviolence and justice for all people from America to Africa to the Middle East. I am getting on the bus to D.C. on April 13 because I understand the history of imperialist oppression and I stand in complete solidarity with the peoples of Africa, the Middle East and Asia. I am against the militarization of Africa. Drones are not the solution, development is! I am marching because the centuries-long oppression of Africa must end. I’m marching on April 13 because I know that, despite the myths about spreading freedom and democracy, the U.S. government is actually just bullying and terrorizing people in other countries. And I also know that if we don’t stand up and put a stop to it, it won’t be long until they use that same technology to terrorize poor and working class communities here. I am marching on April 13 because it’s time to build a movement against imperialism, exploitation, and oppression. I am proud to stand with such a diverse set of people on behalf of the true interests of humanity. Show your support and help spread the word about April 13 through social media! 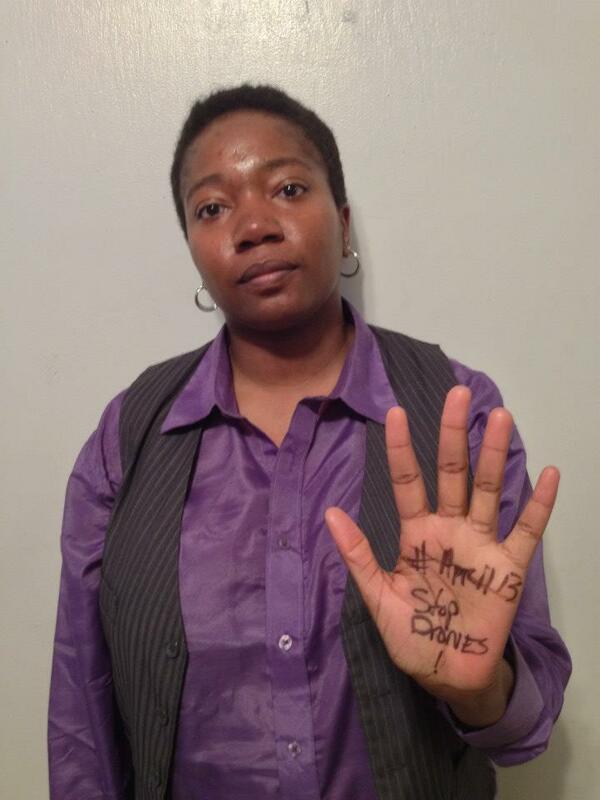 Submit your photo to StopDrones@answercoalition.org showing that you support the #April13 U.S. Drones out of Africa, the Middle East, Asia and Everywhere action! View, share and “like” the full album here. Departing from 135th St. and Lenox Ave (2/3 trains to 135th St.) at 6am on Saturday, April 13, returning around 10pm on the same day. Round-trip tickets are $35. Click here to buy your ticket online. Departing from Temple University, Tuttleman Learning Center, 1809 N. 13th Street at at 8am on Saturday, April 13, returning around 8pm on the same day. Round-trip tickets are $30. Click here to buy your ticket online. Help expose and dramatize the scale of the war crimes committed by U.S. drone warfare by carrying a flag-draped coffin representing the victims of drone attacks. 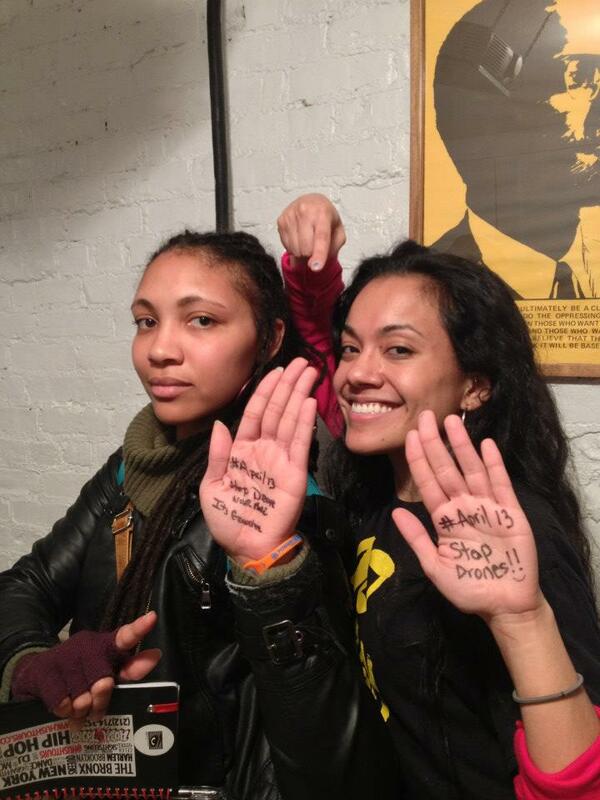 Hold a picture of one of the 5,000 people killed by drone attacks. You can print a picture of one or more of the victims of drone strikes from the website and bring the picture to hold at the demonstration. Participate in a Die-In at the offices of General Atomics corporation, the manufacturer of the Predator Drone. The April 13 demonstration demanding “U.S. Drones out of Africa, the Middle East, Asia, and Everywhere” is continuing to gain momentum with students from a number of universities and Palestine solidarity activists announcing contingents in the march!